I took a brief walk after a working lunch. The sun was high in the sky and the air was cool. 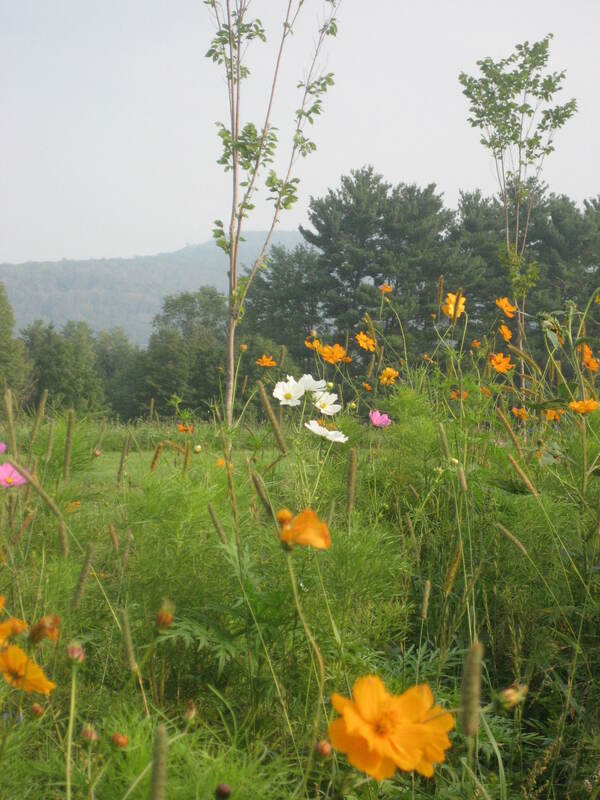 It was a beautiful September day in the Berkshires. 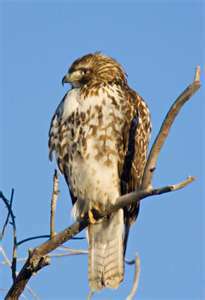 I walked down the hill from the main building at Kripalu and hadn’t gone too far when there, to my right, on a wire overhead was a red-tailed hawk looking this way and that. I stopped and watched the wind lift his tail feathers. He stretched and showed me his white belly and fluffy legs. He — or she — was awesome in structure. He looked strong and powerful. As he sat, he moved his head from side-to-side. He turned once to look at me as I cautiously took a seat on the low wooden rail along the road, then turned his attention back to the tall brush, tangled weeds and wild flowers that framed the woods. I sat contentedly in the sun, thrilled to have this opportunity to be so close to such a creature. I studied the way he slid his head across his back and tried to move my head the same way. 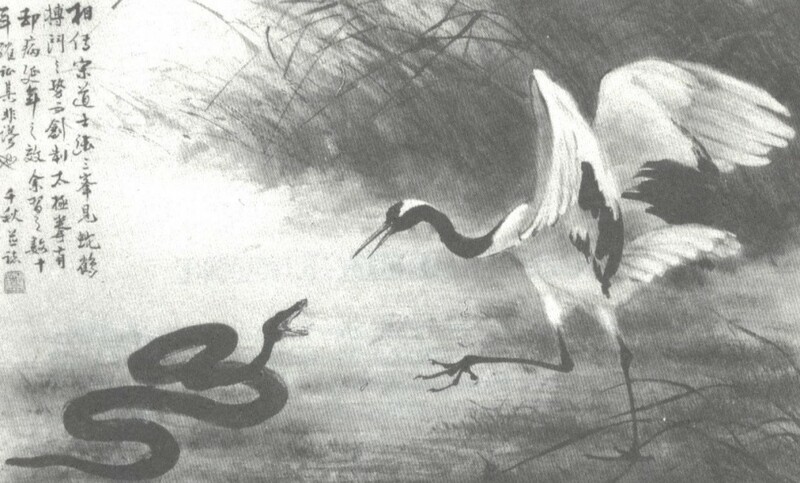 Taiji [Tai chi] teachers always imitated animals — some say Taijiquan was created after Wudang Daoist master Zhang San Feng (12th C.) witnessed a fight between a crane and a snake. My neck cracked just as I heard little throaty chirping sounds come from the underbrush. It sounded like the noise squirrels make, not too loud though, and it didn’t sound alarming — just a steady series of clicks and chirps. Suddenly the hawk spread his wings and dropped straight down into the brush. A terrible squealing commenced and I knew the hawk had caught something. I was struck, mouth open, by the sudden change from sight-seeing on a lovely day to the wailing of an animal dying in the claws of a predator. The racket was awful, but it didn’t last longer than a minute, maybe two. It was heart-wrenching none-the-less. I didn’t know what to do with myself. A city-girl for decades — I was curious, frightened, repulsed and paralyzed. Here was the truth of nature, not on television, but barely five feet in front of me. I didn’t know why this was happening for me to see, but I thought I’d best finish it. I slowly walked closer to the underbrush. I could see the hawk’s white feathers and stopped. He was no more than three feet in front of me, barely concealed by dried grasses and weeds. I didn’t want to see blood. But I couldn’t not look. I stood still. The hawk looked at me the same way he had earlier, unafraid, unconcerned, unimpressed. As I watched, he made a small jump and the captured creature came up with him in his talons. He was in a small clearing, now two feet from me. I could see the eye of the squirrel and the hawk’s talons on its belly. I didn’t see any blood. He kept squeezing his talons into the squirrel — perhaps to make sure it wasn’t playing dead or that it wouldn’t suddenly get up and run away. He fluttered his wings and hopped and the squirrel came up and down with him again, a few inches closer to me. He was coming straight toward me, out of the brush and now, onto the mowed grass. This was more than I wanted to see. I couldn’t fathom why the hawk was coming toward me, with his prey, his prize. I thought of a time my house cat caught a mouse and brought it to me. What did they want me to see? I continued to watch the hawk, two feet in front of me, in plain sight, without cover. Then I realized he was not eating. His lunch was getting cold. I didn’t understand. Out of the corner of my eye, I saw a woman — one of our guests — crossing toward me into the parking lot off to my left. When she got close enough, she looked where I was looking and saw the hawk. “I don’t think you want to see this,” I turned my head and said to her. The woman grimaced and turned and walked in the other direction, toward the main building. When I looked back at the hawk at my feet, he was slowly pulling up with his beak on a long string of something red from the side of the squirrel. I turned and followed the guest up the hill toward the center.